With so many new graphic design books published all the time, it can be tough to know which ones you need on your bookshelf – and which ones probably aren't worth your precious cash. So we've done the hard work for you. Whether you're after a present for yourself or a graphic designer friend, or simply want to bulk up your studio bookshelf, here are the 10 of the best graphic design books to read this year. Dubbed the most influential female graphic designer on the planet, Paula Scher needs little introduction. This stunning monograph from Unit Editions - 2,000 copies of which are available for pre order - covers the Pentagram partner’s early days in the music industry as an art director with CBS and Atlantic records, the launch of her first studio, and her 25-year engagement with Pentagram. According to the editors, the book is also a visual record of contemporary New York’s urban fabric, “indelibly transformed by the designer’s innovative approach to environmental graphics and identity design: from MoMA to Charter Schools; from the High Line to Shake Shack”. The 326-page book includes a long interview with Scher, and sections dedicated to her socially and politically motivated posters, New York Times Op-Ed illustrations and campaign work. We can’t wait to get our hands on a copy. Celebrated type foundry and design studio House Industries released this 400-page book in 2017. Packed with stories, case studies and handy advice, it’s dedicated to answering the question: where do you find inspiration? The books offers a fascinating dive into the minds of co-founders Andy Cruz and Rich Roat, and type designer Ken Barber – and it comes with a foreword from JJ Abrams, too. This significant resource offers a comprehensive survey of the major typefaces produced since the advent of printing with movable type, in the mid-fifteenth century, to the present day. It’s arranged chronologically, showcasing over 320 typefaces either through their original type specimens or earliest printing. Each entry is supported by a brief history and description of defining characteristics of the typeface. if you’re into type, this is a valuable resource. 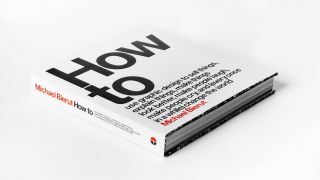 If you still haven’t read Michael Bierut’s excellent How to, then make 2018 the year you do. Protégé of design legend Massimo Vignelli and a partner at New York design firm Pentagram partner, Bierut – like Scher – has enjoyed one of the most successful careers of any living graphic designer. In this monograph, design manual and manifesto, he reveals his philosophy of graphic design, explaining how to use it to sell things, explain things, make things look better, make people laugh, make people cry, and – every once in a while – change the world. The book features more than 35 of Bierut’s projects, providing insights into his creative process, working life, relationship with clients and the typical struggles faced by any designer trying to bring innovative ideas into the world. Inspiring and informative, this is a must-read for any graphic designer. Aaron Draplin, the man behind the branding of Esquire, Ford Motors, and even the Obama Administration takes a look back on his amazing career so far in this heartfelt and pointed retrospective. Pretty Much Everything lives up to its title by tracing Draplin's career back to day one. Readers follow his life story as he sets off to university and forges a name for himself on the graphic design scene. Alongside shop talk there are plenty of charming personal anecdotes which give readers a genuine insight into the mind of the designer. As with any good graphic design book, there's plenty to enjoy here visually. Pages are packed with countless examples of his work, including everything from snowboard graphics to logo designs. Pretty Much Everything is a treasure trove of work and wisdom that any design studio could benefit from owning. A mini-edition of Michael Evamy's much celebrated logo bible was published in 2015, presenting more than 1,300 symbols and logotypes in pocket-sized format. This vast collection includes the work of iconic masters like Paul Rand and Saul Bass, as well as some of the most exciting work from contemporary and emerging designers, plus a series of short texts discussing recent developments in logo design. Here's what Pentagram partner Michael Bierut said: "The next time you are tempted to design a logo, take a look at this book. Chances are, it has already been done. By raising the bar, this wonderful resource will make better designers of all of us." The debut book from freelance art director and illustrator Ben Tallon, Champagne and Wax Crayons is a deeply personal and brutally honest account of starting and surviving in the creative industries. Dealing with the freelance lifestyle, finding your place, developing and branching out into other areas among many other topics, it's a brilliant read for any creative – whether you're an illustrator, like Tallon, or not. New Perspectives in Typography is a typographic treat for designers and typophiles alike. Taking an A-Z approach to contemporary type design, it showcases the work of more than 100 designers – including David Peardon, Philippe Apeloig, Anthony Burrill and some more surprising entries too. Collated by Henrik Kubel and Scott Williams, founders of independent typographic studio A2/SW/HK, the book features 500 beautiful full-colour visual examples, alongside though-provoking essays exploring the past and future of type design. Featuring 75 of the world's most influential designers, this book presents the story of graphic design through the inspiring personal stories alongside large, full-colour reproductions of their boundary-pushing work. It's arranged chronologically, and features the likes of M/M Paris, Wim Crouwel, Tom Eckersley, Stefan Sagmeister, Studio Dumbar, Irma Boom and more (not in that order). Incredibly informative and inspiring, Graphic Design Visionaries introduces many of the key designers every practitioner should know.